After a long day we F I N A L L Y made it back to El Sal! With our second journey through Nicaragua coming to an end, I knew that we had a big and potentially stressful day in front of us. Well, not so stressful for Maya and I. A border crossing should probably be renamed a boring crossing, if you ask me. It’s basically eight hours stuck in the truck, growling at Maya every time she tries to snuggle up, my tummy grumbling because there’s no treats and no food until dinner time. I’m dragged out of my snuggly slumber too early, and kept up too late. All my whining aside, however, I knew it was usually even worse for My Family. And this border crossing was no exception. Leaving Nicaragua, our goal was to cross through a teeny tiny bit of Honduras (a big country that we didn’t have time to visit), and end up in El Salvador, a super fun country we had visited in the spring, with wide beaches and tons of delicious food. We had done this crossing before with no problems, so My Family’s confidence was high, despite not getting much sleep and probably drinking a beer or two more than they should have. The Nicaraguan border was super easy. Last time we crossed here it was during a holiday weekend, and the border was overrun with grumpy humans tired of waiting around in the heat. This time it was almost empty. Maya and I got to sit in the air conditioned truck while Jason handled pretty much everything. We were in and out before I knew it! The drive through Honduras was quick and easy as well. This was shaping up to be a pretty simple day! That’s when the problems began… We pulled up to the border between Honduras and El Salvador, and it didn’t look anything like we remembered. There were all these tin shacks, and trucks everywhere we looked. We were just about to turn around when an official looking human waved us down. He told us we were at a special border for truck drivers, and NOT where we needed to be. Jason thanked him for the help, but he wouldn’t let us go. He wanted to see the health certificates for us dogs, and I guess My Family hadn’t done something properly. At the trucker border they deal with plants, food and animals all the time, and they simply weren’t going to let us just drive away. So there we sat, while Victoria worked with the nice humans there to resolve our paperwork situation. We sat, and we sat, and we sat some more. Jason started getting frantic, as hours were now passing by. All of a sudden, midday was turning into mid-afternoon, and we still had to get through this border and into El Salvador. Just when Jason looked like he was going to give up and turn us around, Victoria came back with all the papers. We were free to go! After that, getting out of Honduras was easy. 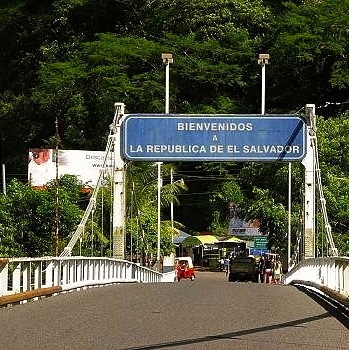 We were up to the final step: getting into El Salvador. We weren’t yet out of the woods, as Jason likes to say. And believe it or not, we ran into even more troubles! They had changed the border since we had been here last, and My Family couldn’t find the building where we had to register our truck and camper! Jason drove back and forth down the same road, and it took us another hour to figure out where we were supposed to be. Now the sun was getting low in the sky, and Jason was getting seriously worried. He left us behind in the truck while he went to handle the final round of paperwork, and we didn’t see him again for like two hours! At this point, even Victoria was starting to get nervous. Jason was as grumpy as I had ever seen him, and Maya could barely keep herself still anymore. The sun was setting, we had already been in the car for nine hours, and we still had to drive to our campsite! As they say down here, that’s no bueno. Jason was almost silent as he sped us down the highway, grumbling to himself every now and then about the potholes (the roads in El Salvador are pretty bumpy), the disorganized car import process (he had to stand around with the truckers and the drug enforcement agents waiting for our paperwork) and our terrible luck in Honduras. It was almost pitch black when Victoria realized we might not make it to the campsite we had hoped to reach and started scrambling for more options. We pulled up at a place called Rancho Clemente after eight o’clock at night, exhausted and grumpy. 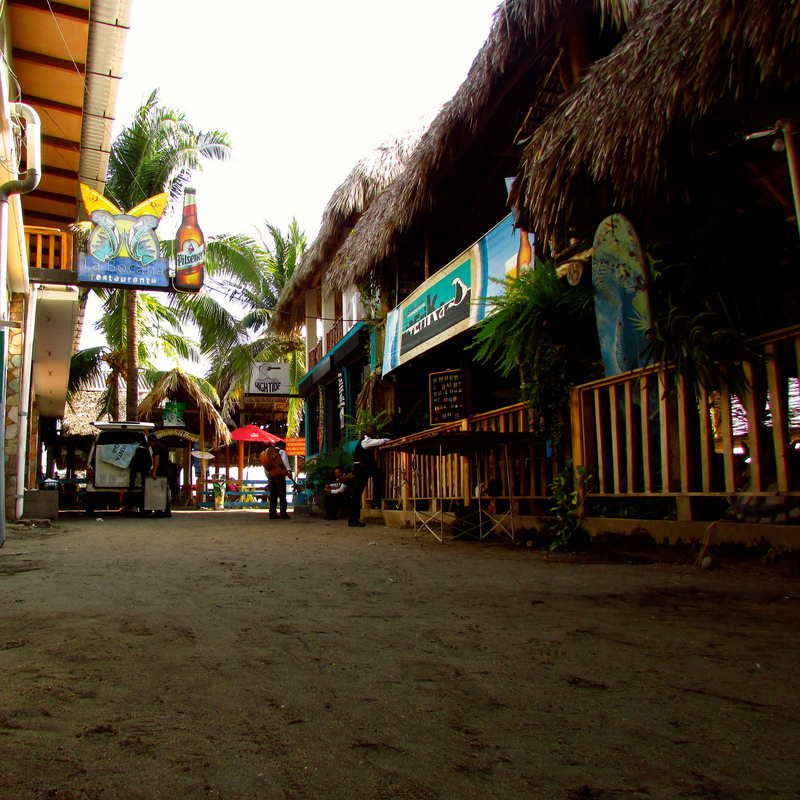 Luckily, our hosts were super nice, and there was a restaurant open right above the beach! Jason and Victoria stumbled into their chairs, while Maya and I sniffed out crumb after delicious crumb off the sand. I don’t know why it was such a problem for us to be eating tasty crab bits, but Jason had no patience for it on this night! My Family got a bit happier after the food arrived, an incredible whole fish and the largest shrimp I had ever seen. We got to taste everything, and we headed back to the camper with bellies full, thankful that this long, stressful day was over. 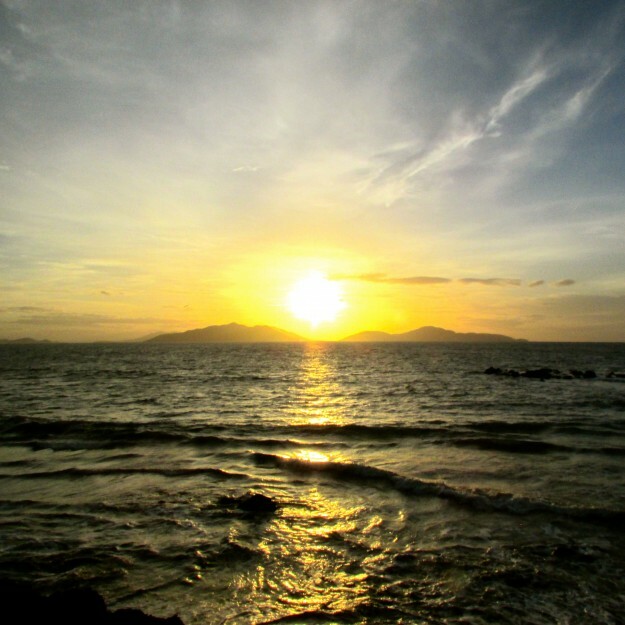 Sunrise (!?!?) over the Pacific. Vic and Jay were pretty excited about this. Before I knew it, Jason was waking us all up. The sun wasn’t even all the way up in the sky, and he was pointing excitedly out the window. Apparently, we were seeing the sun rise over the Pacific Ocean, which I guess is a big deal for humans. Jason and Victoria like geography, and Jason was even on a geography game show when he was a kid! It was a pretty sunrise, with pinks and purples and blues and oranges, but I could barely keep my eyes open. Maya just stared at me, all confused, until I managed to catch a little more sleep as My Family packed up the camper. 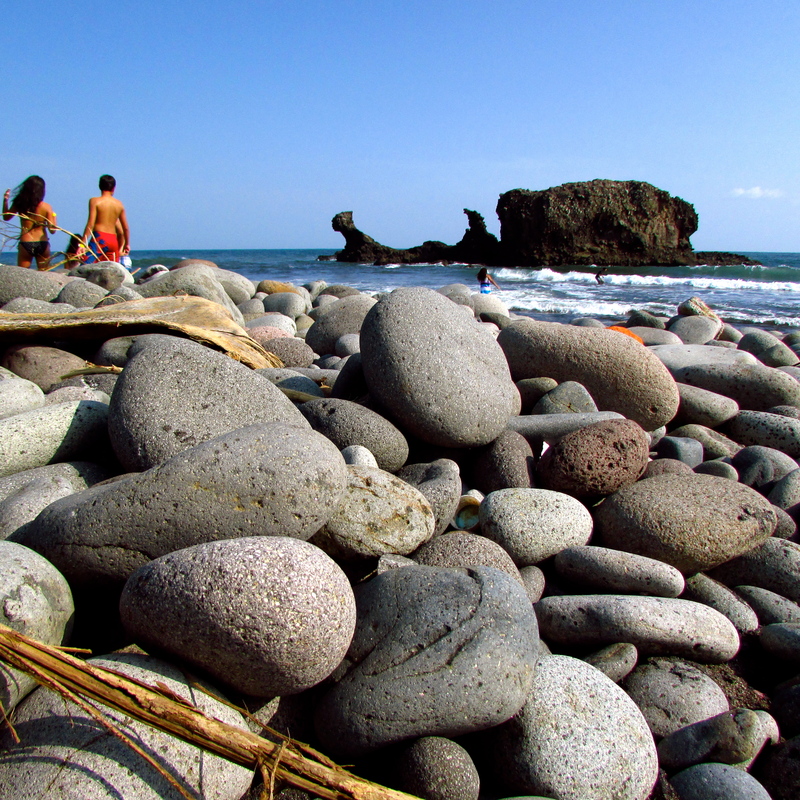 We were off early, headed up the coast to a town called El Tunco. 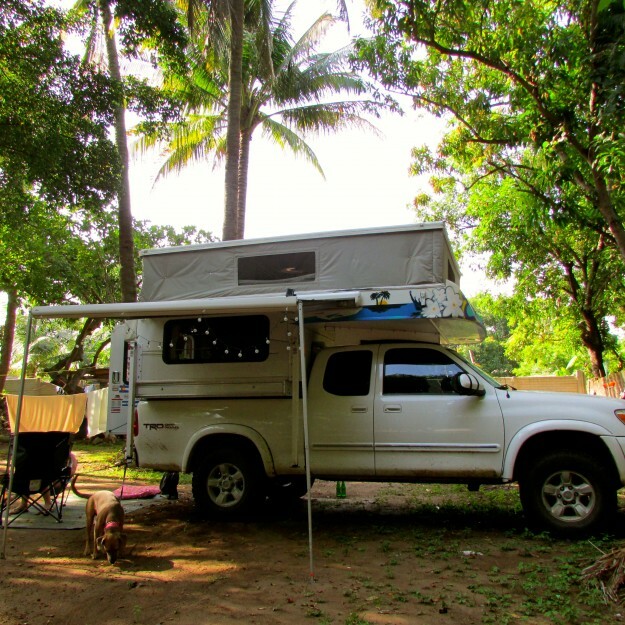 We stopped in a busy town, the marketplace packed with people and dogs and loud music, and a few hours later pulled off the main road and parked at Sol y Mar, the same campsite we had visited our last time in El Salvador. The owners remembered us, and were so surprised to see how big Maya was getting. Maya holding it down at our campsite at Sol y Mar. We spent about a week here, and the whole time we did… absolutely nothing. Victoria hurt her back during our stressful border crossing, probably from shoving Maya back into her spot over and over again, and she could barely get out of bed. I spent most of my time snuggling up with her, licking her nose to make her feel better. Jason, on the other hand, spent most of his time wrangling Maya, who has become quite the goofball. As soon as we wake up, she wants to play. After breakfast, she wants to play. At the hottest point of the day (and it gets pretty dang hot in El Salvador), she wants to play! The only time she doesn’t want to play is when she’s afraid of something, and that’s A LOT of the time. A new person, a random dog, a firework or even a squirrel in a tree is enough to send Maya, tail tucked, running to crouch between Jason’s legs. So between Maya’s nuttiness, Victoria’s soreness and my general grumpiness about doing anything but snuggling up, Jason had his hands full. Even worse, he got a bad cold at the same time. Jason tried everything he could think of to help Victoria feel better, including bringing a sweet human over to the camper and setting up a space so Victoria could have a massage. Nothing was working, however, and our moods were seriously in the dumps. El Tunco is a super cool town, with nice humans, great food and a pretty sweet beach. However, this might have been one of the lowest points of the Big Adventure. Victoria was in a ton of pain, Jason was sniffling and sneezing all over the place, Maya was bored, and it rained every day! Even the beach seemed as grumpy as I was! It was completely different from last time we were here. The sand had been totally replaced by rocks, and the water was so rough that you couldn’t get anywhere near it. My paws were not happy, so we only played there one time. The only fun thing that really happened was meeting the owner and employees of Tunco Veloz, the super delicious pizza restaurant right next door to our campsite. We went there several times, since everyone was so under the weather (and My Family loved the pizza). And they love dogs! They let me and Maya go anywhere we wanted, and played with us the whole time. 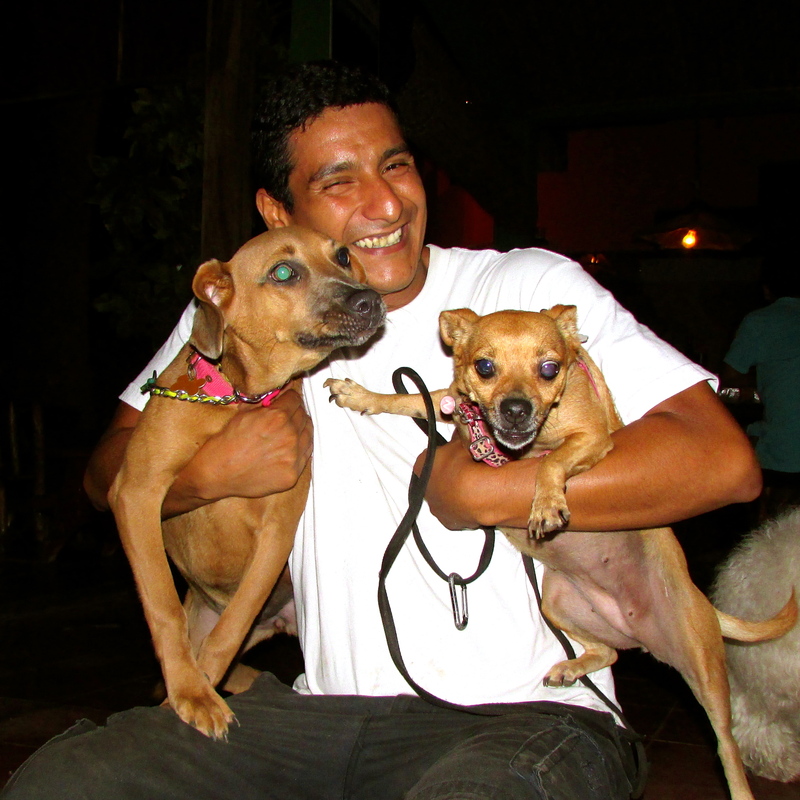 Carlos, one of the nice humans there, even bought us ball toys and treats when he went into La Libertad! Our last night at the restaurant, Maya and I found this awesome toy laying around that the owners keep just so dogs will have something to do while the humans are talking and eating. We loved it so much that the owner gave it to us! How cool! It’s quickly become our favorite toy, and Maya and I spend hours wrestling around with it. Maya and I giving Carlos a big thank you for our presents! Although the original plan included another stop in El Salvador, the state of My Family was so bad that they decided we’d head right into Guatemala with no other stops. We were going to go to Antigua, and Jason knew they had doctors there that might be able to help if Victoria wasn’t feeling better. So Jason packed up the camper and we headed for the border. I couldn’t believe we had to face another boring crossing so soon after the last one, and really no one was in the mood for it that day. Even worse, as we got close to the border the line of cars, trucks and buses seemed to stretch on and on forever. We got stuck behind several gigantic buses, and as we pulled into the border Victoria started to groan. The line at the passport station stretched all the way around the building. We were going to be here forever! Jason left Victoria, me and Maya in the big truck and got in line. I watched through the window as the minutes passed, and he wasn’t making any progress. Out of nowhere, a man came up and knocked on the window. I recognized his smell, and Victoria remembered him too. 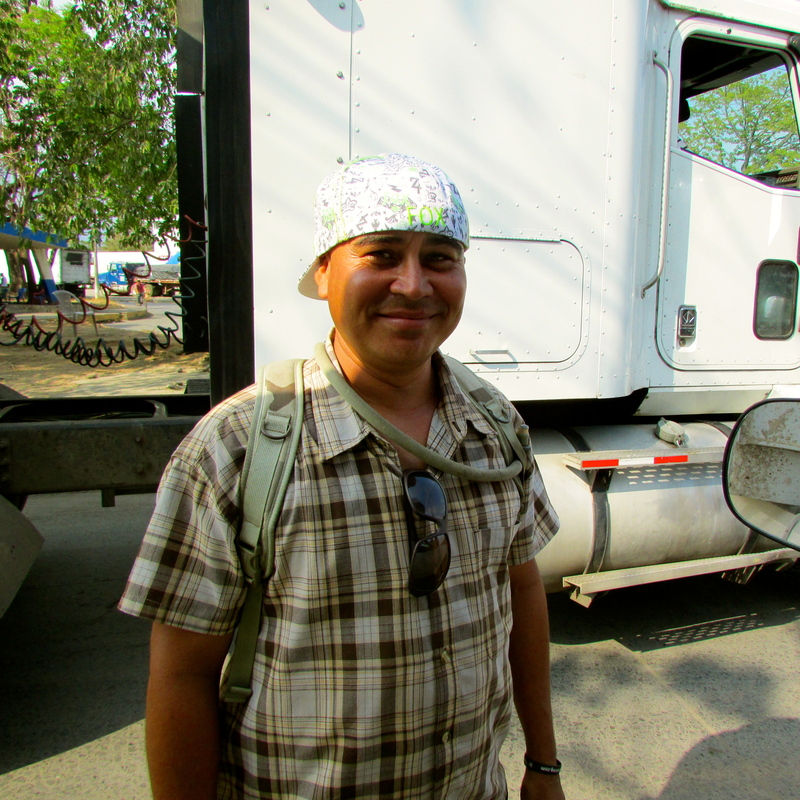 His name was Jorge, and he had helped us out the last time we crossed from Guatemala into El Salvador! Jorge recognized the camper, and asked Victoria if we needed help. She was more than happy to accept, and Jorge went to talk to Jason. We were left in the camper, and I watched as Jorge worked some miracle and got My Family moved way up to the front of the line. It took us a little over an hour to get through to the other side, and Jason thought without Jorge’s help it might have been more like four or five. Victoria was in too much pain to wait that long, so Jason was more than happy to pay our way through. You see, humans use money when they want stuff like pizza and dog treats, but I guess money can help out at borders in other ways. We left El Salvador behind and found the Guatemala border almost deserted. Since we had beat the line, we got through everything else super quick. My Family thanked Jorge and we were on our way, back in Guatemala once again. Our time in El Salvador was very short and super boring, so I was pretty happy we were moving on. I was worried about Victoria, and Jason wasn’t in great shape either. Only Maya seemed to be happy, oblivious to pretty much everything. It’s nice being a puppy sometimes. It’s never great being sick, but being sick on a Big Adventure is seriously terrible. I’ll let you know if things turn around in Guatemala!